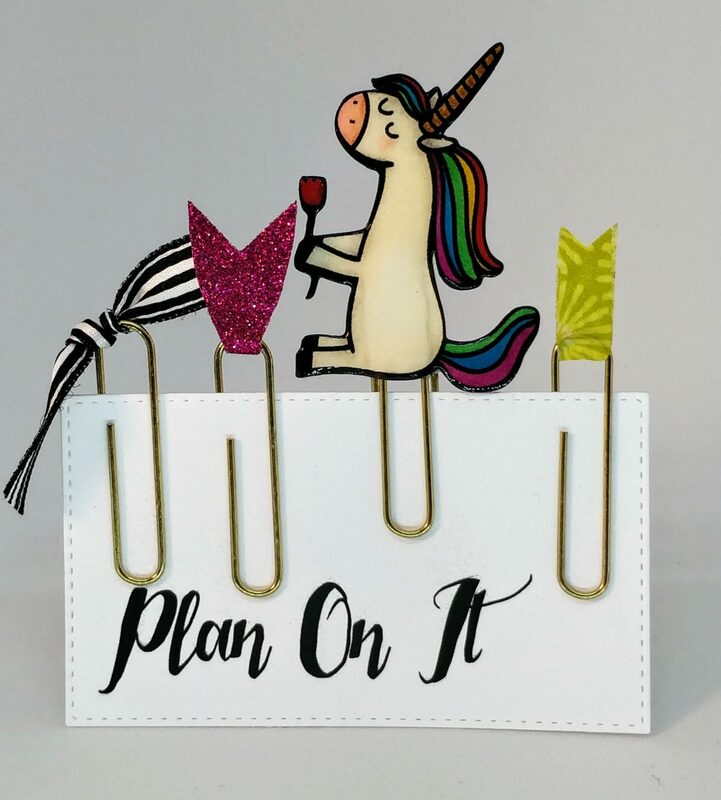 In honor of National Unicorn Day, I’m sharing these adorable planner clips (they’d also make a great gift for your favorite bookworm)! For the unicorn clip, I chose a stamp from the Unicorn Farts set from Beth Duff Designs. I stamped the same image twice on heavy cardstock, colored one and cut them both out with my Scan ‘N Cut. I sandwiched a jumbo paper clip between the two images, pretty one on top. I used glue and a little foam tape to adhere them together. To dress up the back of my clip, I added a coat of Wink of Stella and signed my name, so the recipient will know it’s a handmade gift from me. You can add a special sentiment if you’d like. To protect the cardstock and give it some shine, I added two heavy coats of Glossy Accents, allowing it to dry completely between coats. Then, simply use ribbon and washi tape in coordinating colors to accent a few more clips and you have a wonderful gift set. I printed out and die cut a tag to clip mine onto but, you could use them to decorate a handmade card and get double duty out of them! What do you think? Have you made your own planner clips or bookmarks before?